In the craptastic strip-mall-laden suburb where I grew up, the most exotic food available was Mickey’s Gyros on the corner of 111th Street. My Midwestern college didn’t offer much more variety than about eight different pizza delivery places. I was in my twenties before I had Thai food or became familiar with Indian cuisine. Sushi was a whole separate mind blow. I was determined to raise my kids in the city—as much as they complain about how much bigger their cousins’ yards are—for a variety of reasons. One of the many advantages is the cultural diversity, leading to a multitude of different kinds of food available. We live just east of Albany Park in Chicago’s Northwest side, one of the most ethnically diverse neighborhoods in the country. Within just a few blocks, you can spy restaurant signs for Vietnamese, Mexican, sushi, Lebanese, and various different kinds of kebab. My kids weren’t even in the double digits yet before they already had their favorite Indian dishes picked out (the list begins and ends with butter chicken and cheesy naan) and were anxious to go to the farmers market to visit the empanada stand. I credit a lot of this exploration to my husband: Remember Brian from last week? I’m a fairly adventurous eater (although I draw the line at unfamiliar meats, like elk or boar. Also not a big fan of lamb or runny eggs). But the strip malls I grew up surrounded by made me unfairly biased against the mom-and-pop restaurants that may have had less than sterling settings up and down Kedzie Avenue. Brian had no such qualms, diving into more exotic restaurants with the kids while I was teaching or hung up on a deadline. By the time I went to the local Vietnamese place with them, the owner called us all by name, and gave us a free plate of deep-fried Oreos. Alongside these restaurants were often groceries that I had walked by a hundred times without considering what was inside. Brian frequently visits places like Chicago’s beloved Korean grocer Joong Boo for a variety of curry pastes and some take-out sticky buns, or a supermercardo for dried chilies, in his quest to replicate many of the dishes he’s enjoyed out. One of his hugest and easiest successes, which I still can’t get over, is the dish that inspired this whole column series: panang curry. Here’s the base of panang curry: Thai red curry paste and coconut milk. That’s it, and it’s amazing. Nowadays, you should be able to find these two items in the ethnic food aisle of most grocery stores. B throws some chicken and red pepper in there, but you can basically use any protein such as tofu, beef, or fish, and vegetables like mushrooms, potatoes, and peas. He also adds a little extra ginger. But that’s it. He says that “the success of the dish rests on the tightrope walk between hot and sweet,” and apparently the cans of coconut milk and chili paste are in perfect harmony with each other. 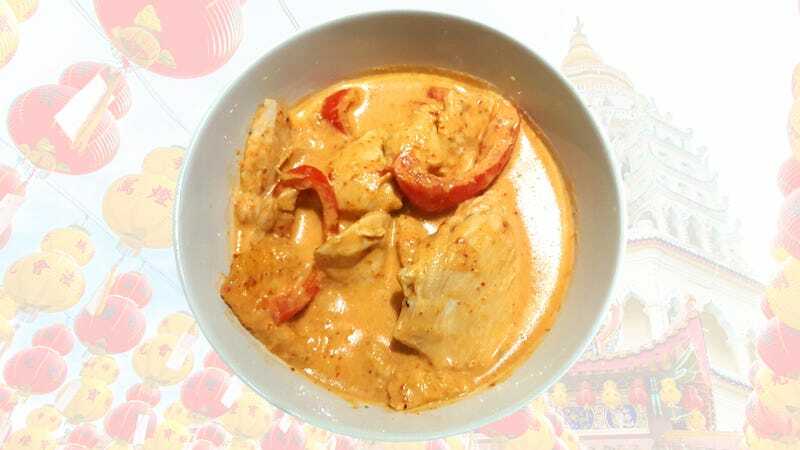 If you walk away from this column with nothing else, throw a dinner party or have a date over and serve this panang curry—then lean back and just rake in the accolades. You are welcome. Cut chicken into 1/4-inch slices across the width of the breast. In a bowl, mix chicken with ginger paste and a pinch of salt. In a skillet, heat 2 tbsp. of olive oil and sauté chicken on medium-high until 80 percent done. Remove chicken and reserve. Lower heat to medium-low. In skillet, add coconut milk, stirring until smooth. Stir in curry paste until fully incorporated. Bring mixture to a simmer. Stir in palm sugar (or substitute with equal parts brown and white sugar) to taste. Our family members can handle varying levels of spiciness, so adding sugar helps lessens the heat for the less adventurous. Place chicken back in to finish cooking with the red pepper (about 5 minutes).